When reading the notes and making the demonstration Teddy Bear for the Soft Toy workshop, I discovered that using a Clover Mini Iron and a Tailor’s Ham would be two very useful pieces of equipment. They were especially good for pressing those ¼ inch wide narrow seam allowances and getting into all the tight curves. 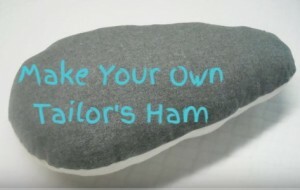 My original Tailor’s Ham was deep in storage along with all my tailoring equipment, but no matter, I had time and materials so decided to make another. I checked out on You Tube and quickly found a great video (https://www.youtube.com/watch?v=jZ1tCdMrsIk) complete with pattern drafting instructions and within an hour, hey presto, a new tailor’s ham. For my new Ham I used two layers of plain Cream 100% cotton fabric and stuffed with my usual polyester toy stuffing that I buy by the kilo through eBay and use for all my cushion pads and soft toys.